The first step of Childhelp’s approach to ending child abuse is to prevent the cycle of child abuse from continuing. There are clear links among child maltreatment and future violence perpetration or victimization; studies show that about 30% of abused and neglected children will later abuse children, continuing this horrible cycle. We believe the key to preventing child abuse is education and awareness, which is exactly what our prevention programs provide. Childhelp’s prevention programs work with children, families, and communities to provide long-term education and increase awareness of abuse and neglect. Childhelp Speak Up Be Safe for Educators is a school-based, child abuse prevention education program that teaches children about the many forms of abuse and what to do if they, or anyone they know, are ever involved in an abusive situation. Childhelp provides a full curriculum to participating schools with the materials and tools needed for each child in the program. Childhelp Speak Up Be Safe for Athletes gives coaches and athletic program leaders the curriculum and materials needed to educate and promote child abuse prevention for young athletes. In addition to educating students and athletes, we believe that it’s also important to educate families as a whole, which is the primary focus at the Childhelp Community Center in Arizona. The Center offers before and after school programs, care, as well as classes for children and families to learn healthy family life skills. We hope to see these prevention programs in all schools and athletic programs across the country to one day help eliminate child abuse. Read more about each of our specific programs by clicking the links below. The next step of Childhelp’s approach to ending child abuse is dedicated to intervention and removal of children from abusive and dangerous situations. More than 80% of the children who die as a result of child abuse or neglect are not yet old enough for kindergarten, making it impossible for them to remove themselves from harmful situations. Childhelp’s Intervention Programs are dedicated to intervening and preventing these children from becoming part of the statistic. Childhelp intervention programs protect children from danger along several steps of crisis resolution. The first step in our approach is the Childhelp National Child Abuse Hotline, a 24/7 resource for children, parents, caregivers, teachers, and concerned individuals who suspect abuse may be occurring. The hotline offers crisis intervention, information, literature and referrals to thousands of emergency, social service, and support resources. On average, the Childhelp National Child Abuse hotline receives well over 100,000 child abuse calls a year. While we have made significant progress, there’s still so much more work to be done! The next step in the intervention of child abuse is providing children with a safe place to live. Childhelp Group Homes give children a place to call home with counseling, therapy, support and the structure needed to heal. Lastly, Childhelp’s Foster Care & Adoption Services work with children and families to find good long-term matches to ensure that every child’s future is brighter than their past. Read more about each of our specific intervention programs by clicking the links below. Another step of the Childhelp approach is helping to treat children who have been affected by child abuse. The issue is substantial; a report of child abuse is made every ten seconds, which means we have a lot of work to do to help treat these children. Childhelp’s treatment programs exist to give children a safe haven with love and the tools needed to overcome their damaging pasts. One of our most impactful programs thus far is the Childhelp Residential Treatment Facilities (Villages) which provide specialized and comprehensive treatment programs for court-referred, severely abused, neglected, and at-risk children. Childhelp Villages not only provide children we serve with a safe place to call home, but provide therapy, love, education, medical attention and guidance needed to heal. Among our treatment programs, we also have Childhelp Advocacy Centers, which are child-friendly facilities where members of the multi-disciplinary team are co-located, and interview, medically examine, provide and refer treatment for abused children while law enforcement agencies and county attorneys pursue the prosecution of offenders. 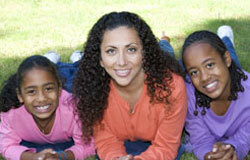 Childhelp’s treatment programs are some of the best programs in the world for abused and neglected children. Read more about each of our specific programs by clicking the links below. Through our prevention, intervention and treatment programs, we make a huge difference in the lives of abused and neglected children. By educating children and families, promoting prevention, intervening in abuse when it happens, and treating those who have already been affected by child abuse, we can stop child abuse, one child at a time.